I feel somewhat dazed waking up, perhaps as a result of continuing heat exhaustion, the perennial hard mattresses, or both, although I would be reluctant to criticize anything about the 2N Guesthouse. Not surprisingly, the breakfast served is impeccable, with several slices of toast and jam, good coffee, and a plate full of fruit, including bananas and cut pineapple, jackfruit, sapodilla, and rose apple. The owner is attentive to our needs, returning promptly to ask whether we want more coffee or toast. During daylight hours, it is apparent that the house is in immaculate condition, as proper and clean from the outside as it is inside. I join in the conversation the two American women at the next table lead, my interjections perhaps unwelcome. 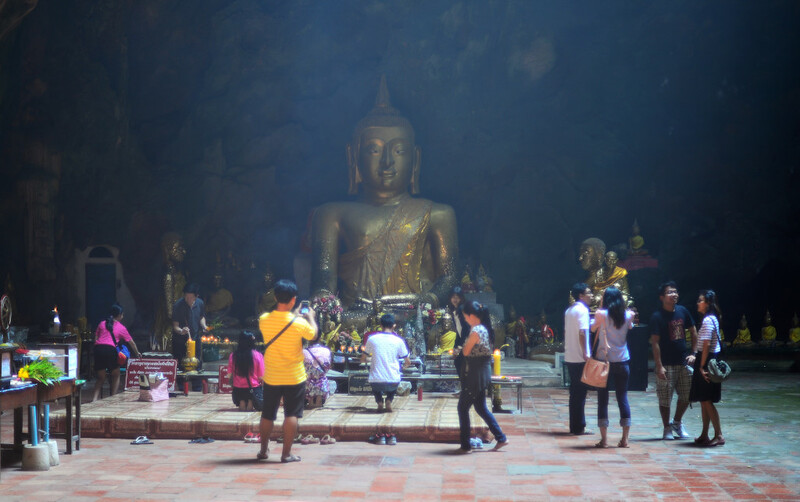 Having attempted the trip to the cave temple at Tham Khao Luang yesterday and turned back due having been swarmed by large numbers of macaques, they would like to try again today, but ideally with more people so as to feel more secure. Christine and Ellen return to their room while I continue drinking coffee and chatting with the owner. 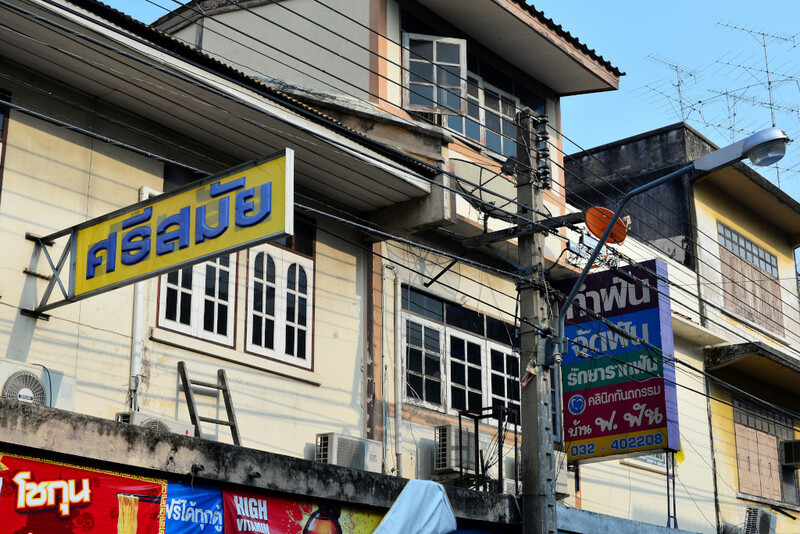 It turns out that the guesthouse is owned by two sisters, one who worked in the tourism industry in Bangkok for years, the one I am speaking with now having lived and worked in a Thai restaurant in Columbia, South Carolina for 12 years. The parents wanted her to come back. When she did, the two sisters built this guesthouse, and despite it only being a few years old, they run it like a well-oiled machine. It would seem that their knowledgeable professionalism is largely a product of their own travel experiences, understanding the small details that make such a hospitality establishment function seamlessly. She would happily return to the U.S. to live, but couldn’t consider it due to her parents. 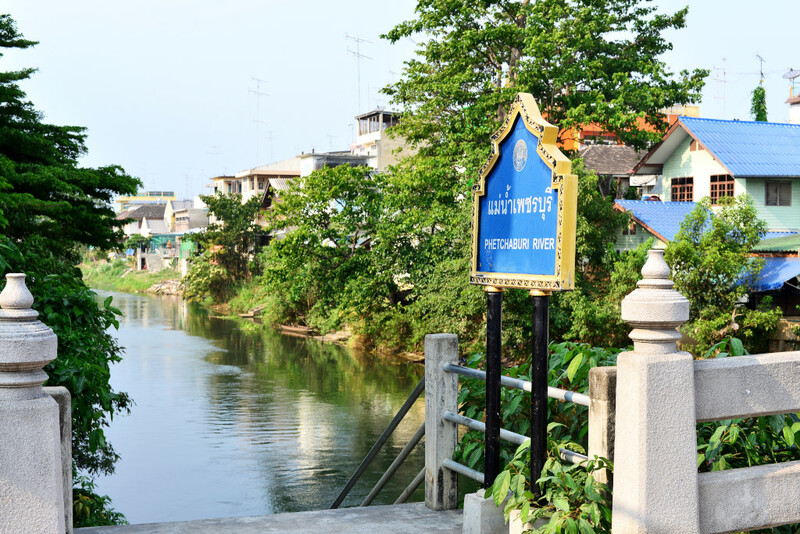 The ride to the Tham Khao Luang is hardly very long, down some very broad and sleepy suburban roads, then up a steep hill, unfortunately requiring us to push the bikes, although not far, the searing heat already palpable on our skin. The macaques scatter across the terrain, scampering hither and thither, although none look to be particularly threatening. It is fairly apparent that they are being well fed, vendors selling baskets of cooked corn and other foods to be given to the monkeys. Hence the monkeys are largely just curious, although with an ever-hopeful glimmer in their eyes at the possibility of some terrific tasty morsel coming their way. We cling with unnecessary panic onto our bags, convinced we are about to be attacked by the monkeys. We descend the stone staircase into the gaping maw of the cave, and once on firm ground, behold the cavernous stalactite-rich cavern before us. 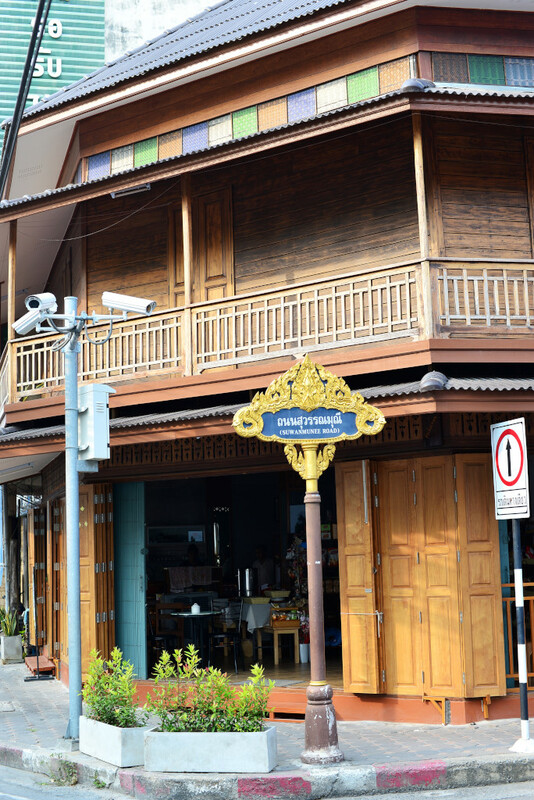 Beyond a few foreign tourists, there are numerous local groups and individual travelers. Rows of gold fabric-swathed Buddhas sit in solemn rows in the excavated passages, in addition to an altar with a much larger figure, seated in the indirect path of the radiant sun’s rays pouring from an opening above. The temple is a hybrid of gold and stone laid out in a play of light and darkness. 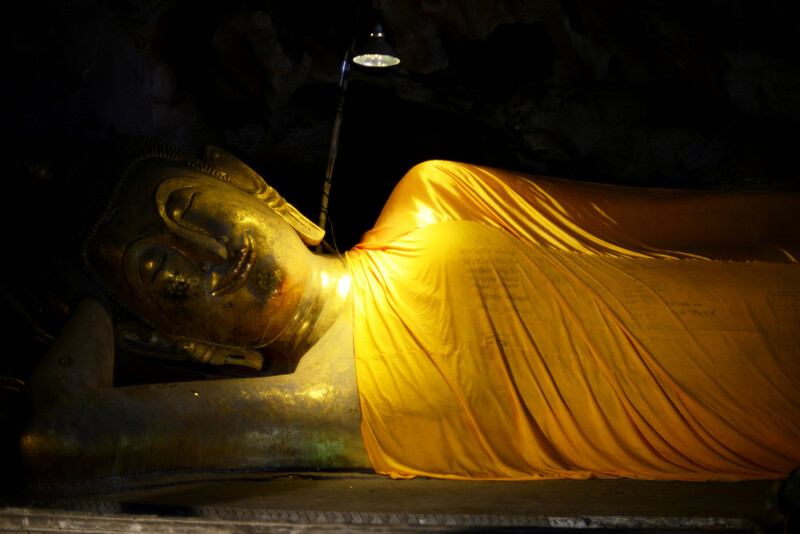 The scene would naturally not be complete without the obligatory giant reclining Buddha swathed in the golden fabric. 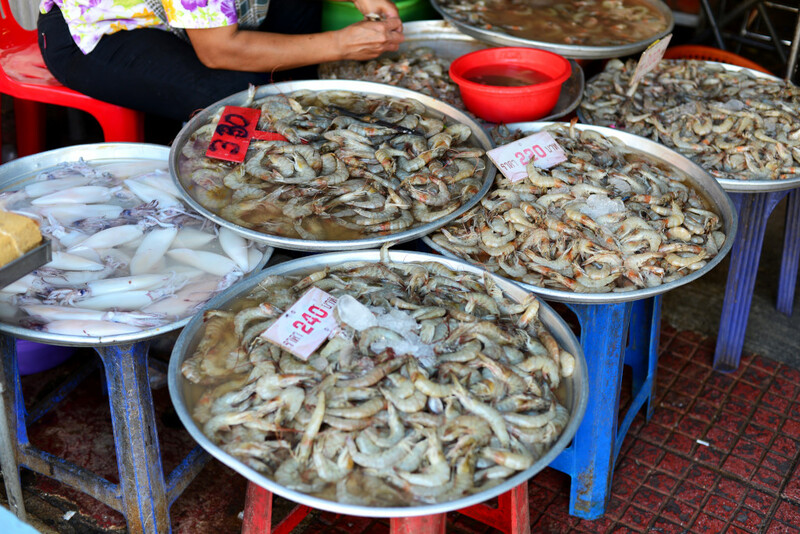 Our conversation takes an interesting turn, broaching Christine’s newfound freedom, having brought her glimpses of other cultures she had heretofore never imagined, in particular, the enrapturous month she spent in Myanmar. 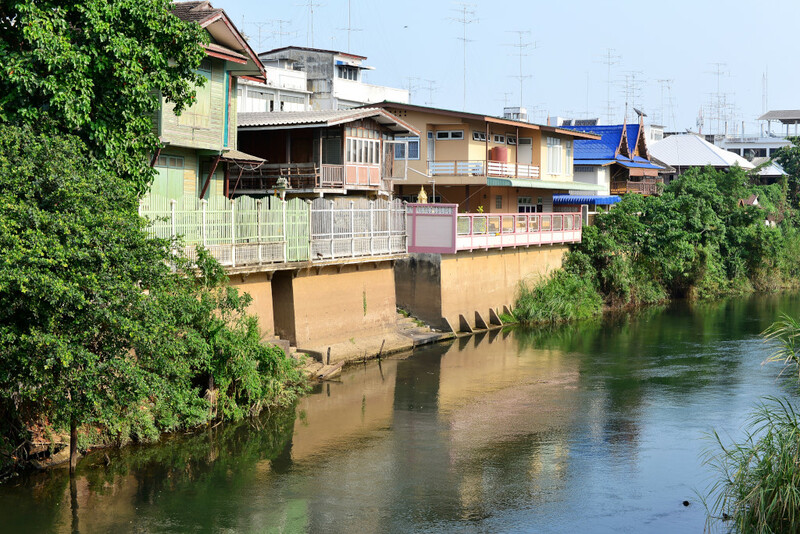 She had rightfully dreaded returning to Thailand, roughly mimicking my own experiences some 20 years ago, and has only began to like it in the country since yesterday. I listen raptly to her words, deep inside the Tham Khao Luang cave temple, recognizing the extent to which our stories mirror each other. We continue onto the contradictions that exist between world cultures, touching upon the notion that where there is material want humans may be rich in spirit, and where humans are rich in material possessions, the spirit may be bereft. Christine abandoned her last job in Brussels (where she and Ellen know each other from), and now she has up to a year to see as much as she wants to. I could recommend a lot of places, both here and elsewhere, but as a woman traveling by herself, Southeast Asia may be the best place to concentrate on, the relative safety offered to women one reason why the region is so popular. As meeting people goes, it feels like we have known each other for years, even though I felt a bit of trepidation initially joining their company this morning. 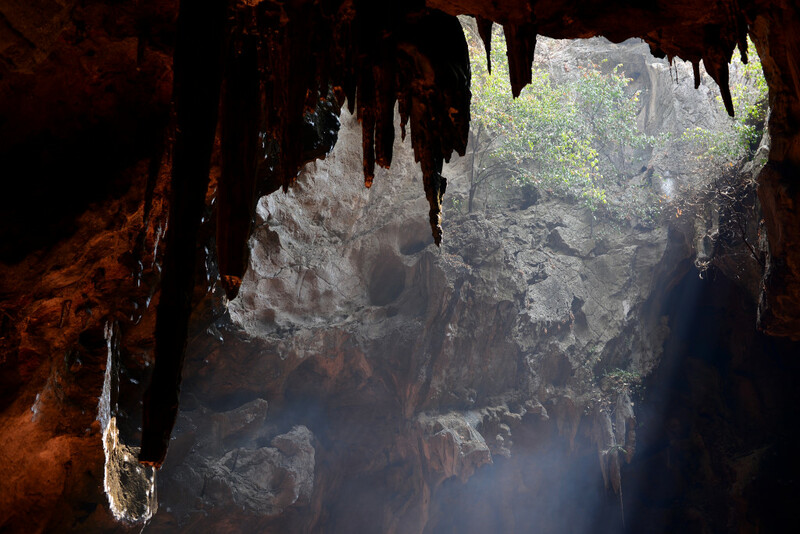 I suggest that we could also visit the other cave temple, Tham Khao Banda-It, north of the mountain temple that dominates Phetchaburi. While the heat in the cave below is somewhat moderated, above ground we re-emerge into the scalding fury of the tropical sun. The monkeys are no more motivated to approach us, scampering fearfully in odd directions as we amble along the parking area and then down the hill, the brakes on Corinne’s bike shrieking like some tortured banshee. A longer bike ride along the overheated streets of this modest town awaits us, a stop at one of the ubiquitous 7-11s in an attempt to dehydrate, past the macaque-infested grounds leading to Wat Khao, circumnavigating its scrubby circumference, and then with trepidation through the traffic roundabout and under the freeway. 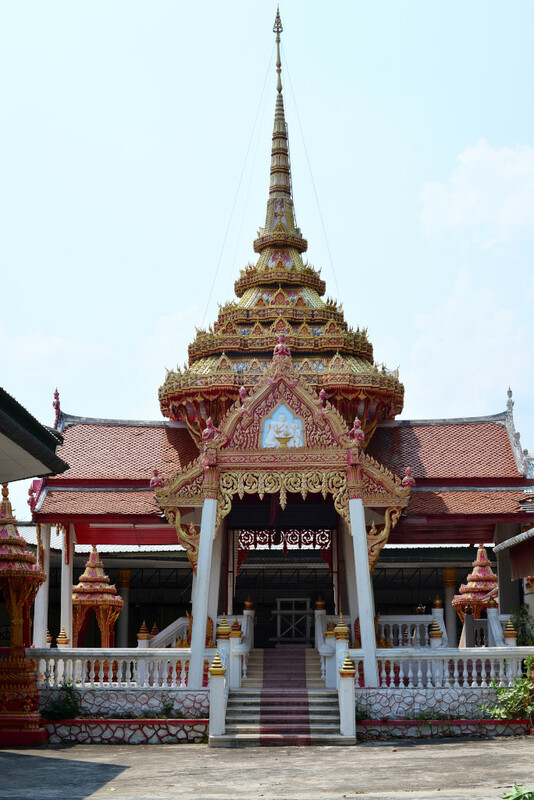 Yes, the man standing on the shaded lot confirms – Tham Khao Banda-It lies up above us, another hill we have to push our bikes up, and another torrent of sweat running from our bodies as we reach the parking area. For some reason here, just as at the last cave temple, the automobiles are covered with plush brown alligators, a surreal compliment to the stray dogs and monkeys that compete for sovereignty with the flock of chicken scattering erratically before us. We are waved towards the entrance to the cave among the heterogenous array of structures, a number in the process of being completed, a smattering of visitors attending one of the buildings, the entrance to the cave along a walkway among the scurrying baby macaques. Descending into the narrow below-ground cavern, it becomes apparent that this cave lacks the drama of the one we just left. Obligatory rows of gold-swathed Buddhas are arrayed before us, but smaller and in lesser numbers. The larger caverns are quite small, the size diminishing as we progress from one to the next through small openings in the rock. As is the case with the last cave temple we visited, we happily do not encounter bats of any sort. 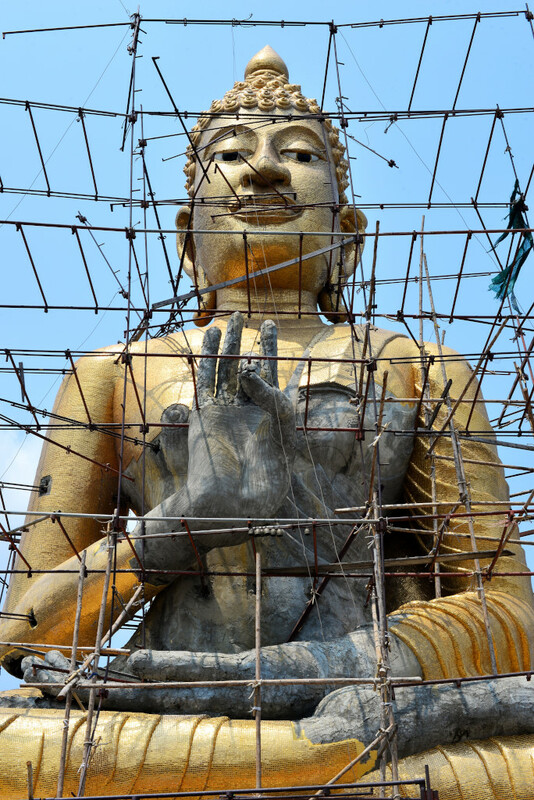 But the real allure of the place is the walk further up the hill, then through the open-faced structure to the terrace on the superior level with a giant golden Buddha under construction. Panoramic views are offered of the surrounding town and countryside, the billowing winds on this elevation offering reprieve from the searing heat. On the way down, a group of macaques hiding in a small shelter panics at the sight of us, one female clutching a baby to her breast and racing off in the opposite direction. The two would like to eat somewhere, say in the market area, although I am somewhat loath to be promenading around the market at this time of day, unwilling to risk finding myself unwittingly in some of the less appetizing, claustrophobic and overheated areas. Happily, the playful small eatery catty corner from the Wat Mahathat Warawihan is acceptable to them, the interior largely outfitted with the same teak as the carved exterior fascia, the shelving stocked with intriguing and uniquely conceived snacks, supplemented with simple but extremely tasty hot foods served from the back. 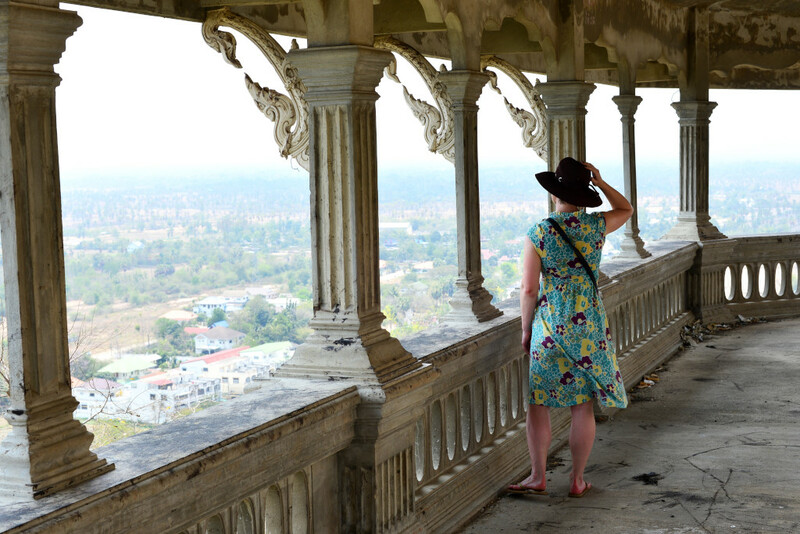 Continuing on the subject of travel, Christine is somewhat circumspect about going just anywhere, having recently spent a year working in Hyderabad, and having no illusions as to how threatening being a woman traveling alone in India could be. 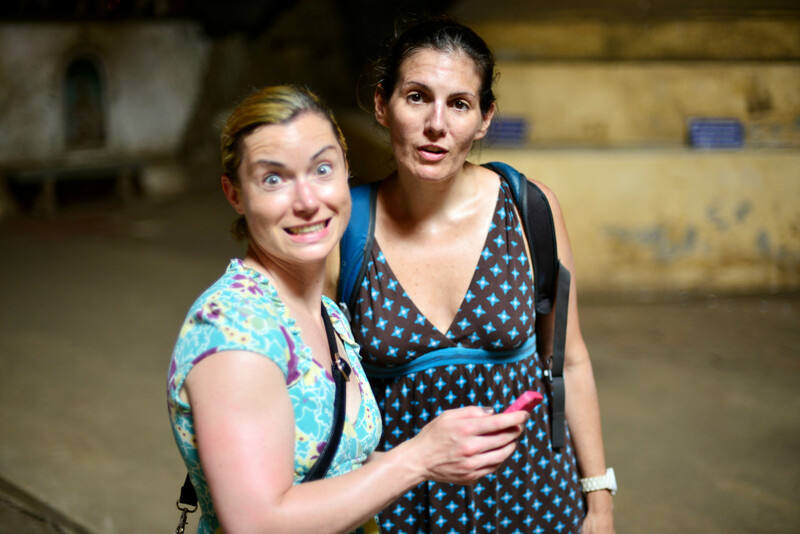 I express amazement at the extent to which western tourists experience India in the most remarkably wholesome manner, considering what the country is like from my – and no less Christine’s – experiences. Across the alley, another equally whimsical cafe offers mediocre Italian coffees on an intimate terrace lined with potted plants on one side, and vitrines filled with comical mannequins on the other. Ellen is past the point of drinking a coffee – she is simply exhausted from the heat, and the grinding work schedule she left behind in Brussels, which was followed by a short trip to Los Angeles just before coming to Thailand. Working for SAP is no walk in the park, she tells us. Once upon a time, the company had a clear enterprise vision, but now it is trying to be many things for many people, which makes working with the enterprise application far more of a headache. Since they are leaving this evening for Krabi, they want to return to the hotel and get some rest, but beforehand, buy some fruit. 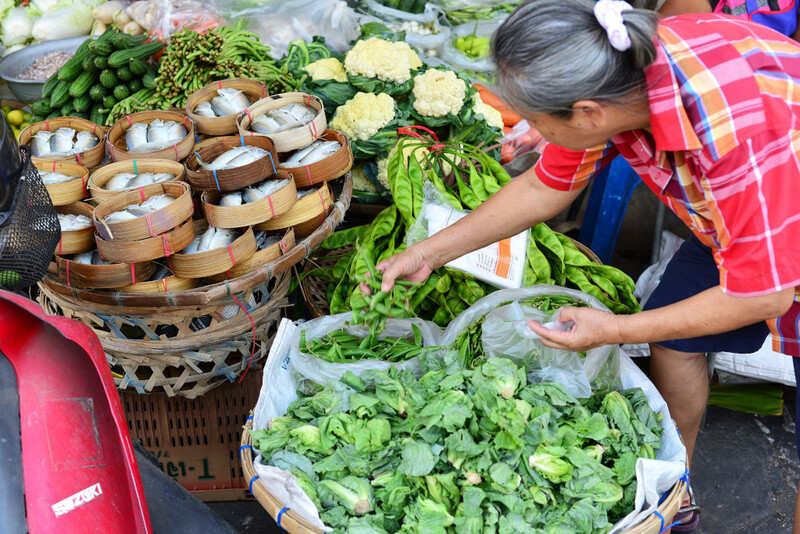 In the market, the few remaining stalls still open are attended to by mostly middle aged or older women, placid, stoic, occasionally smiling warmly as they guard their limited merchandise, including cabbage, bok choy, onions, chilis, tiny eggplants, tamarind, rose apples, mangos, devotional flowers, pickled fruit, fish of various sizes, heaped in their respective piles, a few slabs of pork or beef, or chicken feet. 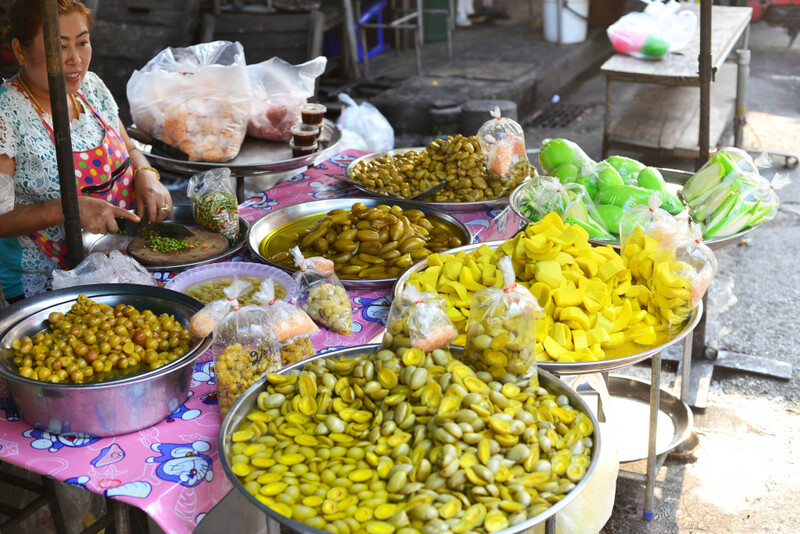 I set aside my normally frugal stance and indulge, buying some jackfruit and some far more expensive but very memorable marian plums, resembling a cross between apricots and mangos. 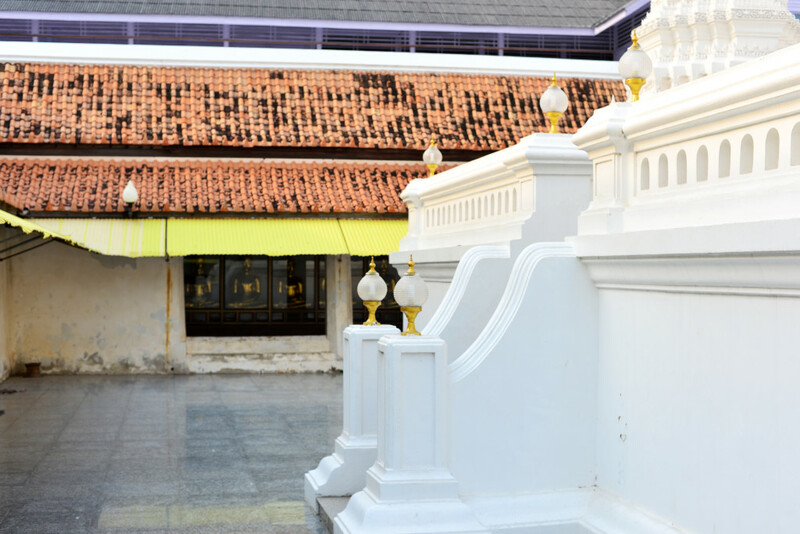 I am happy to continue to the neighboring Wat Mahathat Warawihan where we parked our bikes, the tall slender white prangs relics of ancient times, not that the modern renovated structures would imply anything to the effect to the unsuspecting visitor. 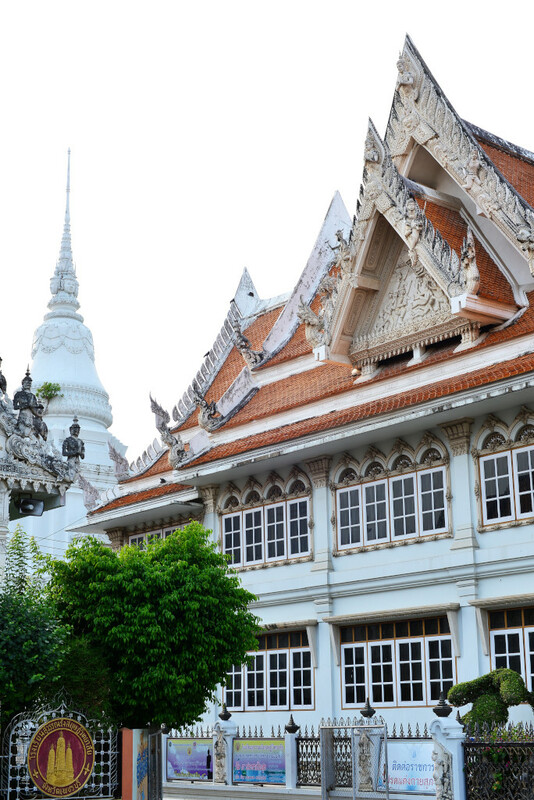 Fluted, narrow, and inset with standing gold Buddhas, the prang are iconic in Phetchaburi’s skyline. 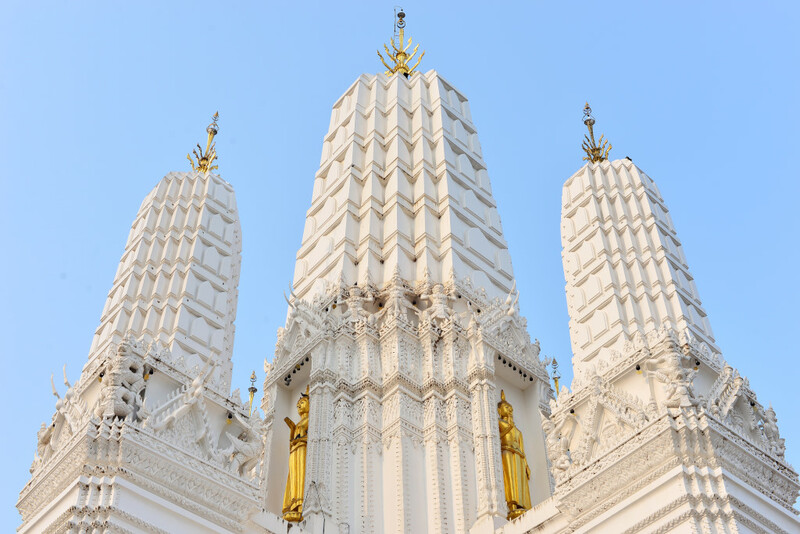 Three successive golden Buddhas line the back of the central temple structure, flanked by smaller figures that adherents affix the devotional gold foil to, the loose filaments fluttering in the ventilators’ breeze.